This post was written for the Dog Agility Blog Event. You can see all the fabulous posts here. When I first read that the subject for this month's blog action day was "Internationalization" I have to admit that, much like my dog when she has no clue what I'm on about, I cocked my head to the side and went "Huh?" We're a pretty green team. Ok wait. Back up. We're a super green team. And we're not talking about those lovely mature shades like forest green or hunter green. We're talking something like, say, chartreuse. That color that's part green and part yellow. The perfect color for Dahlia and I. Part newbie, part scared out of my wits, part ready to tuck tail and run when faced with a course at a trial. If I could, I'd get all her ribbons in chartreuse. It seems fitting, after all. What all this means is that I had to ask people what on earth "internationalization" meant outside of "going someplace other than the USA to trial." So I asked a community I belong to. Here were a fewof the answers that made the most sense to me. International courses are hard and set up to really challenge handling. To me, an international course is wrap-centric. More hard angles, backsides of jumps, lots of twisty turns. Definitely made to challenge your handling skills. I understand all of that. 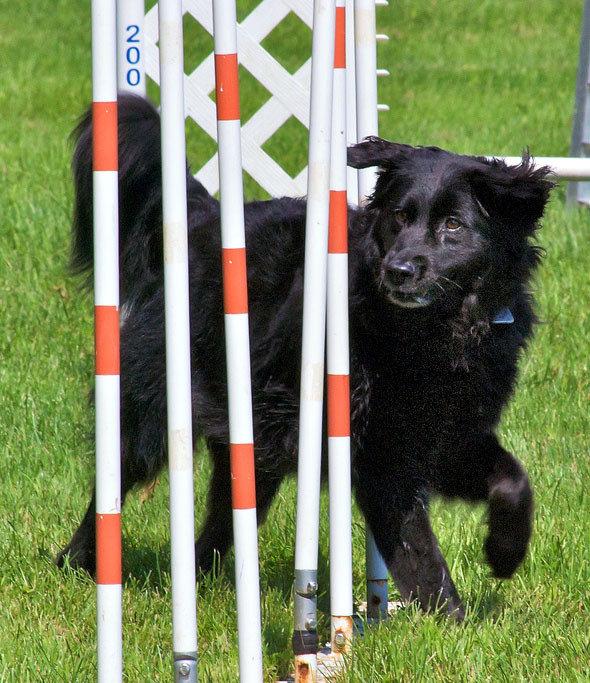 I may be green, but I've been involved in agility for over two years now and I've been reading about it and studying courses and talking to people about it for several years. However, can I execute any of that? Well, some. But certainly not all. Maybe not even most. So when I watch these amazing international competitors my mind sort of boggles at how they get it all done, at the speed and grace and amazing fluidity of their running, the connection they have with their dog that at times seems almost supernatural. I love watching it. But frankly, it scares me. Dahlia and I? We're not "international" material. We're not even national or regional or state material. We're just a girl and her dog enjoying some time together. We're CPE Level 2, not International. People have been talking about internationalization "trickling down." I understand it. I really do. People want more challenges. But please, as you're considering these new challenges, as you're thinking of ways to up the ante, please don't let it trickle down too far. Already, from my understanding, AKC Novice has become much harder than it was several years ago. For someone at my level, it's incredibly challenging. I spent an entire year in CPE Level 1 just trying to master the basics (and CPE Level 2 is awfully close to level 1, so we haven't progressed too far). I attempted AKC Novice twice, both times failing to get one Q. Please try to remember the newbies, the green handlers, and even more so, the chartreuse ones like myself. We're out there to enjoy ourselves, but if courses for newbies are too challenging, how many people are going to be scared off? How many are going to throw in the towel and quit? Sure, you may say "Then maybe they shouldn't have been doing that in the first place." But why so? Doing agility, even at our lowly level, has created a wonderful bond between Dahlia and I. It's given her more confidence and more joy. If we had quit early on because it was too challenging for us, none of that would have happened. And that would have been a real shame. i so agree :) thanks for your honesty! I've been very happy to see many people who are iffy on internationalization and the new challenges. I was expecting a lot of blogs being excited for it and it's been a real mix, so I'm glad to see I'm not alone! Totally agree. Novice isn't just about handling a newbie dog. For me it was about getting in the ring, with people watching, being judged. I was terrified, so nervous, my hands shaking so badly, I could not get the leash hook latched back on my dog's collar. I could not hear the judge nor concentrate so I released from the table before "go". I got lost on course. I didn't need a threadle or serpentine to make it challenging. I had never competed in anything before. The simple course held plenty of challenges. Now, 3 years later, I'm working towards my first MACH and nothing much bothers me. We do the more challenging maneuvers with some skill. I understand the trialing environment and know the routines. But it was quite a trek getting there. I still enjoy watching the novice teams, reminding me of the long and challenging journey I've been on and wanting to help other newbies. I will never ever forget the experience. All very excellent points! There's such a huge difference between doing things in class and doing them at a trial. In class, we're pretty darned good with serpentines and threadles. At a trial, I'm lucky my dog leaves the start line (which hasn't always happened...last trial we were both so stressed out she refused to move). I've always been a performer (music) so having an audience doesn't usually faze me, but the whole trial atmosphere with judges and ring crew and people running around and talking and other dogs and a dog who is a bit uncertain with a handler who is more than uncertain is a whole different ball game! An excellent perspective, and one AKC has already failed to appreciate with some of the T2B courses I've run (and therefore quit running). Not because I can't accomplish them, but because it was never my intent to add a 3rd technical course to my dogs' masters courses--and because I don't feel like supporting a class that advertises itself as green team friendly and then whaps novice handlers upside the head. That isn't fun for anyone who's paying attention, inside or outside the ring. AKC folks need to let novices be novices...*comfortably*! Yes! Totally. I think that's why I love CPE and have been focusing on that. I don't just have a green dog, *I* am green and I liked the way they built up the levels so that I could go out there and be somewhat comfortable running a course. I knew it wouldn't be overly technical and would probably just have one or two simple crosses. It gave us more confidence, especially with not having to worry about EVERYTHING like weaves and teeter right off the bat. We ran a T2B course in a class once. I can't imagine running it in a trial. I'm not sure how having everyone running the same course makes it "Novice friendly." It reminds me more of when I was in school and they had A1, A2, and A3 classes and then got rid of them. Instead of having people learn at their own level, everyone was at the same level. What that meant was it was too easy for the A1s and far too hard for the A3s. The "Goldie Locks" thing isn't always right. I find T2B to be "just right" for only some people. As a Novice it was in the "way too hard" category. It was definitely NOT an easy course and was really far above our level. In class we broke it down into chunks to work on the various parts, but there's no way we would have been successful at it in a trial situation. Sometimes I think agility venues forget there are people new to the sport too. Many who are in Novice have their second or third or tenth dog there. But some of us? It's really our FIRST dog and so we're learning how to execute handling moves at the same time we're teaching our dogs them. It makes it a lot harder! I have been trialling for about 5 years. But with the same dog. We are a pretty well-oiled machine. BUT, I'm getting ready to trial my young dog. And I am scared! Those novice courses aren't what they used to be. I can imagine that when I get to my second dog I'm going to be scared out of my mind at the first trials regardless of previous experience. CPE Level 1/2 courses seem much more straight-forward than AKC Novice and I so hope they keep it that way. Beautifully expressed. I am an older person who pretty much only gets physical activity when I play with my dog. He and I enjoy agility together, but if it becomes so complex that we can never be successful I am afraid I wont enjoy it anymore. I mean its hard to enjoy failing ALL the time. I couldn't agree more with this! I see a lot of older folks and some handicapped people out there doing agility with their dogs. Some people just couldn't physically do all the tight twisting and turning (and nor could some dogs) that these "international" courses require. I'm no spring chicken (I'm 37), am a bit overweight, with a bad knee from an old marching band injury and asthma (exercise-induced). I can do ok in agility, but I'd be afraid all the tight twisting would damage my knee further, so I'm glad to do some more straight forward courses with my slower dog. And you know, I get that some people don't want to be "stuck" at one level, but I think even just getting as far as being able to step out there and do a USDAA Starters, AKC Novice, or CPE Level 1/2 course is exciting. A lot of training goes in to getting you even that far! Excellent post! Agility is supposed to be about doing something challenging together as a team, and having fun doing it. Some challenges are for some of people but they are not for everyone. That's why I LOVE that so many venues have emerged with agility...what other dog sport has that?! I do NADAC...mostly because it's either that or AKC in my area...but I did choose NADAC over AKC for many of the reasons you stated in your post. International styles, USDAA styles, NADAC styles aren't for every person...but what a wonderful thing that there are so many great choices out there. I am SO thankful for all the wonderful venues that cater to different needs. Around here we mostly have AKC, USDAA, and CPE. I chose CPE because it fit our level. I've done some AKC stuff but never managed a Q there (though we've come close!). But the more generous course times and more straight-forward courses fit our super green level so much better than anything else. I'm gearing up to possibly try USDAA as I like some of the wide open courses and my dog runs much better if I can run. She hates all the tight turning.